The Mighty Endeavor activates partnerships around the state to engage school-ages students, libraries, veterans and youth organizations. All information gathered will be uploaded to the Veterans' Legacies database at www.veteranslegacies.com. Once a veteran’s story is entered, it will become part of a free resource that will serve current and future generations. We began this Mighty Endeavor in the Northwest, collecting the histories of those who enlisted or were commissioned from Oregon. While this initial phase of The Mighty Endeavor has grown out of work being done in Oregon, we encourage those all across the country to contribute information to the Veterans' Legacies database. To gather the stories there are various methods of research available. Whether communicating via email, phone, Skype, or face-to-face interview, we encourage those involved to seek out photos, video, an journals to include in the stories about each veteran. The uploaded information about each veteran, known as a VETERAN BIO, will become part of the Veterans' Legacies database, easily accessible and free to use. Every image, video clip, and scanned document will serve to tell the story of the men and women who served. The database, www.veteranslegacies.com, is a public site, accessible to all, at no charge. To upload a veteran's bio, or look for information about someone who served, go to www.veteranslegacies.com. The goal is to collect the stories of veterans and ensure they are available to eduators, students and families for generations to come. We are working closely with the National Archives, and volunteers to upload the records our brave men and women who have served and protected our nation. These records will give students, teachers, and researchers the information they need to begin building a biographies for each and every veteran. In partnership with OregonASK, the State Library of Oregon, the Oregon Historical Society, Oregon WWII Memorial, the Oregon Military Museum, volunteers throughout the state will embark on a grassroots journey to connect with individuals and their families. Individuals and families are encouraged to participate as well! The Mighty Endeavor has developed a curriculum to provide guidelines, instructions and support for those interested in working on the project. The curriculum ensures educators have to the tools needed to help their students learn the editorial, journalistic, and technical skills needed to complete full biographical profile of any given veteran..
We encourage teachers, students, families, and services groups to take on this project in local communities to help ensure that we reach the largest number of veterans and individuals who participated in the war effort. 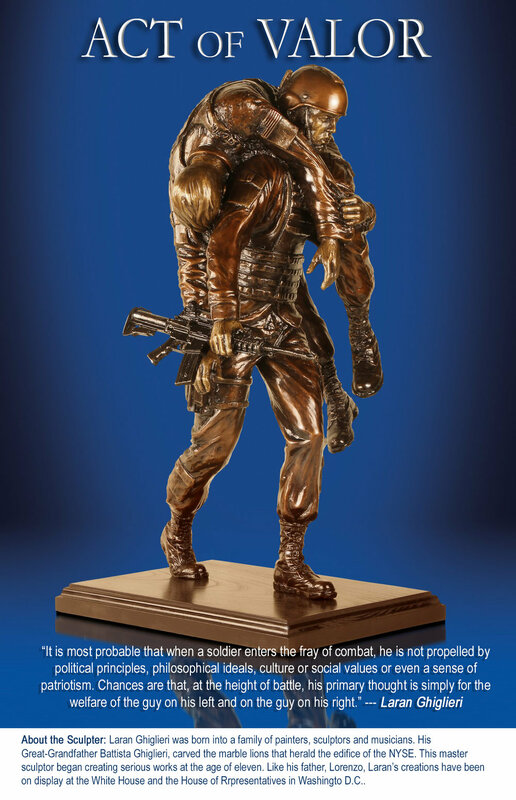 The 'Act of Valor' is valued at $28,500. It stands at 25 inches tall on a 16 x 11 ½ inch base. On Display at the Stoller winery tasting room. Odds of Winning: 1 in 250. Raffle Date and Winner to be announced once all 250 tickets are sold. 100% of the proceeds go to help us Preserve veterans stories, Honor their service, and Educate our youth.